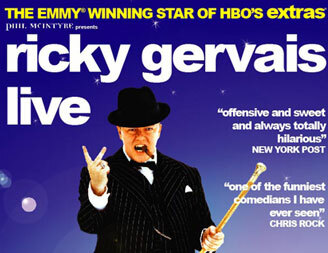 Ricky Gervais is coming back to play the WaMu Theater at Madison Square Garden on July 14 & 15, 2008 (wow, only 7 months in advance). Presale begins tomorrow Friday, December 14 at 12 NOON and goes until Sunday, December 16 at 9PM. General public on sale begins on Tuesday, December 18 at 9AM. Click here to purchase your tickets and be sure to use promotional code HERICKY. In other Ricky news, the series finale of Extras airs on HBO on Sunday, December 16.